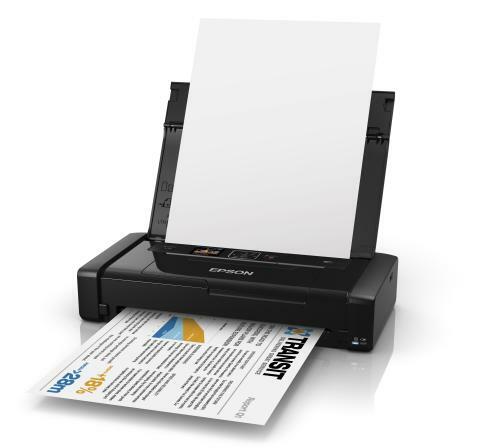 The Epson WorkForce WF-100W is a lightweight, wireless printer that was made for printing on the go. It’s a portable printer that's ideal for printing A4 documents anywhere. The Epson WF-100W portable A4 inkjet printer with built-in battery is compatible with Google Cloud, iPrint, Apple Air and various other mobile print applications. The Epson WorkForce WF-100W printer measures 309‎x154x61mm and weighs just 1.6kg. It can be charged via AC adapter or USB and comes complete with a car adapter too. It folds up to be small enough to fit into a handbag or briefcase, but you can also carry it in your hand. What’s more, the Epson WF-100W colour inkjet printer has a built-in plug and play driver and a 37mm colour LCD. The capacity of the two separate Epson WF-100W ink cartridges is approximately 250 pages for the black Epson 266 cartridge and 200 pages for the tri-colour Epson 267 cartridge. Epson have marketed the WorkForce WF-100W as the world’s smallest and lightest A4 inkjet printer. Being completely portable is the biggest advantage of the Epson WorkForce WF-100W inkjet printer, as you can take it with you anywhere. It also creates high quality pages at a maximum resolution of 5,760 x 1,440dpi and can print in both monochrome and colour. For paper handling, the Epson WorkForce WF100W portable inkjet printer can carry up to 20 sheets of plain paper, though it can print on media as heavy as 300gsm. In addition to being wireless, the WorkForce WF100W printer also has a USB 2.0 Type Mini-B port. Plus, the built-in battery can print up to 100 pages monochrome and 50 pages colour and takes just three hours to recharge. The LCD display on the Epson WorkForce WF 100W inkjet A4 printer is a bit small and would be better if it was a little bigger. It would also be more productive if the WF100W printer had a Type-B USB port for PC compatibility.